What is Immunotherapy? How Does it Work With our Immune System? Stimulating your immune system to work harder or smarter to attack cancer cells. Giving your immune system additional components, such as synthetically-made immune system proteins, to help it effectively fight cancer cells. The Cancer Treatment Centers of America created a short video explaining more about cancer immunotherapy. You probably have a good idea of how the immune system functions. In straightforward terms, the immune system helps protect you from infections and other diseases. Immune cells continuously travel through the body ensuring that any germs that create ailments don’t get a strong foothold. Your immune system has a sort of computer database that tracks all the cells and other substances normally found in your body. So, when it senses an element out of place, it runs the element through the database. If it’s not found, the immune system investigates by sending out a type of scouting part. If the scouting party confirms the substance doesn’t belong in your body, it gives out a battle cry and attacks. The immune response can destroy almost anything, including some cancer cells, which is how it keeps you healthy. That’s why maintaining your immune system in good working order through a healthy lifestyle is essential. 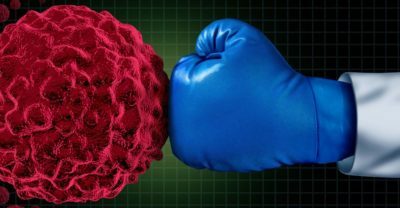 Why can’t the immune system kill cancer cells? Cancer cells have high IQs because they used to be healthy cells in our bodies. As a result, they understand how the immune system works. Scientists aren’t sure what causes normal cells to mutate into cancerous ones. But they do know the mutation includes a disguise that makes cancer cells still appear normal to the immune system. The immune system scouting party sees them and thinks they are friendly cells, and so passes them by without attacking. Failure to strike results in the cancer cells growing and spreading throughout the body. Even if the immune system recognizes them as cancerous, it has difficulty targeting them. The defense system of cancer cells contains a special membrane that is almost impenetrable. Even the best immune system isn’t strong enough to fight it effectively. Immunotherapy is not a new concept. Research on it began in the early 1890s. However, scientists are just now beginning to understand how to change the interaction between white blood cells, called T-cells, and cancerous cells. Immunotherapy drugs, known as checkpoint inhibitors, remove the disguise from cancer cells so that when T-cells, or the scouting party, approaches, it recognizes cancer as an enemy substance and attacks. One of the most promising immunotherapy methods is chimeric antigen receptor (CAR) t-cell therapy. With this approach, immune T-cells are taken from the patient’s blood and modified in the lab by placing specific antigen receptors (called chimeric antigen receptors, or CARs) on their surface. Antigens are toxins or other alien substances that induce an immune response in the body, specifically the production of antibodies. The reprogrammed T-cells are injected back into the patient. This reformed scouting party now recognizes cancer cells and can launch an assault against them. Tests reveal that each modified immune T-cell can multiply to as many as 10,000 new cells and survive in the body for years resulting in high remissions rates . CAR T-cell therapies being studied are not available in clinical trials for all cancer patients. Only those patients whose cancer is not responding to treatment or has returned after treatment are eligible. Although primary outcomes are promising, not enough time has passed to know if this is a path to long-term cures. Research is also still being done to determine if there are any side effects. In this two-minute video, the team at The Parker Institute talks more about how cancer immunotherapy works and how they’re approaching it. What is immunotherapy used for? Because immunotherapy encompasses treatments that work in different ways, researchers know that it works better for some types of cancer than for others. Sometimes it’s used by itself for certain cancers. Other times combining it with related treatments works better. Some approaches boost the body’s immune system in a general way while other therapies help train the immune system to attack cancer cells specifically. Use of immunotherapy for cancer is still a relatively new science. Consequently, it could be as long as ten years before it’s understood well enough to be considered a standard treatment option. The future of cancer immunotherapy may lie in combining types of cancer vaccines with checkpoint inhibitors. Either way, a method of eliminating the disguise cancer cells use to suppress the immune system could be the optimal pathway to treating cancer. However, researchers don’t understand enough about how checkpoint inhibitors function. Through more research, scientists and doctors will learn more and possibly produce a way to target specific cancer cells more precisely. The vaccine for cervical cancer is one such example. The next 20 years will see breakthroughs in immunotherapy approaches. The use of computer prediction with molecular analysis will play a significant role when evaluating the effectiveness of cancer vaccines. Additionally, the potential power of combined immunotherapies may allow doctors to target cancer while avoiding toxicities and other side effects. If you’d like to learn more about cancer immunotherapy, you may be interested in the following TED Talk by Arthur Brodsky, Ph.D. with the Cancer Research Institute (CRI). Where can I find more information on immunotherapy? In spite of the progress that has been made in immunotherapy, results are different for each person. The same is true with more conventional therapies like radiation, chemotherapy, or surgery. If you or someone you know has cancer that is not responding to traditional treatment and you’d like to find out if there is an FDA-approved immunotherapy for your specific cancer, talk to your oncologist. You may be eligible for a clinical trial. A listing of active clinical trials can be found by clicking here. Want to become an oncologist? If this article sparked an interest in you to become an oncologist, you may be interested in The Apprentice Doctor® Academy. The Apprentice Doctor has developed and perfected an Online Course for Future Doctors to assist you toward fulfilling your dream of becoming a medical professional. The For Future Doctors Foundation Medical Online Course with accompanying Medical Kit has helped launch the career of thousands of want-to-be doctors. The American Cancer Society medical and editorial team, What Is Cancer Immunotherapy?